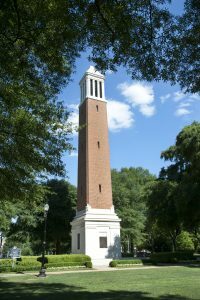 TUSCALOOSA, Ala. — Thanks to the generosity of more than 58,000 donors, The University of Alabama set a new record for gifts and pledges received during a single fiscal year, raising more than $120 million in the 2016-17 fiscal year. The record, which occurred during Bell’s second full year as University president, eclipses the previous mark of $116.4 million set in 2012, as well as the University’s average of $102 million for the previous five fiscal years by 18 percent. Bob Pierce, vice president for Advancement, attributes much of the success to the president’s leadership and vision for the Capstone. During the record-setting year that raised more than $120.7 million, donors provided nearly $25 million to fund endowed scholarships, $20 million in endowed gifts for programs, $18 million to aid with campus construction projects and facility maintenance, and $4 million in endowed gifts to support faculty. Denny Chimes, a UA campus landmark. Fourteen gifts exceeded $1 million, and 7,667 were from first-time donors. The total includes all new gifts and pledges to every area of the University, including Athletics, as well as planned gifts at full face value. Highlights of the recently concluded fiscal year, which ran Oct. 1, 2016 to Sept. 30, 2017, include significant gifts from Mike and Kathy Mouron, Eugenia Dean via her estate, the Cathy Randall family, Gaylon and Susan McCollough, Marillyn Hewson, and Hugh and Eliza Culverhouse. These cornerstone gifts will elevate programs all across campus including Adapted Athletics, CrossingPoints, Computer-Based Honors (which is now the Randall Research Scholars program), a new institute for premedical scholars, data analytics and cybersecurity in the Culverhouse College of Commerce, and the Law School. As state funding for higher education decreases, UA relies more than ever on donors to provide private support for the future of the University by investing in its students, faculty and facilities. U.S. News and World Report ranks The University of Alabama’s Manderson Online Business Master’s programs 13th in the nation. The rankings are based on level of accreditation, faculty credentials, admissions selectivity, reputation for excellence among peer institutions and academic and career support services offered to students.